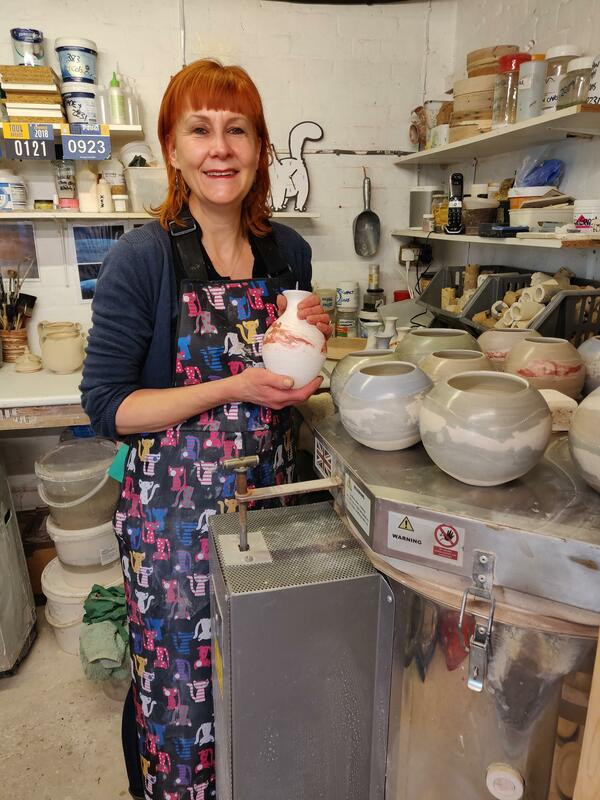 My pottery training began way back in 1986 and comprised of a 4 year apprenticeship with a local Norfolk potter and subsequently 4 years of study at Anglia Polytechnic University. I then went on to become resident potter at a small tourist attraction in Norfolk for 7 years where I produced & sold a range of functional stoneware. Since then I have been developing my work in my small workshop in Oby, in rural Norfolk. After many years of making hand thrown stoneware, a rediscovery of the pleasure of raku firing has inspired me to explore the non-functional vessel. The enjoyment goes far beyond a passion to create, but a need to be out in the open-air, often at day break, when birdsong competes with the roar of the gas torch. My very basic raku facilities demand a calm climate and that I constantly monitor the weather – usually tied to a fairly ordered lifestyle, part of me curiously takes pleasure in the fact that the elements dictate when I can fire. Since this resumed passion for raku firing, I now make two ranges of work – functional stoneware pots for use in the home and individual raku fired vessels. The pots in my stoneware range are individually wheel thrown. Each piece is decorated with impressed decoration using stamps, cogs, buttons & roulette wheels which form pattern on their surface. They are then glazed with my own glazes to enhance their textural surfaces and fired to stoneware temperatures making them durable, functional pieces. firing, but my smaller vessels have been sealed to make them water-tight for flowers which complements an innate aspect of my work to produce ‘useable’ pots. Last year one of my ‘earth’ pots was bought by a customer working for the European Space Agency in the Netherlands. I also had the opportunity to meet ESA astronaut Tim Peake and was able to gift to him a piece of my work which was inspired by his amazing photography from the International Space Station. I have been a full member of Norfolk Contemporary Crafts Society since April 2011.